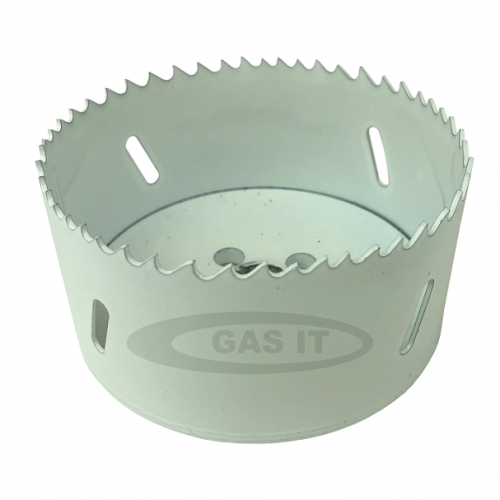 86mm Hole Cutter - GAS IT Leisure Gas Bottles, Gas Cylincers and Gas Tanks - Catering, Motorhome, Campervan, Caravan, Farrier and Road Repair Refillable Gas Solutions. If you want to fit a GAS IT or Gaslow Fillpoint and your installing it in a double skinned Caravan or Motorhome wall then you need to make the inside hole bigger to allow the plastic 70mm fill box to compress and mount correctly. Its made of Bi-metal construction. Hardened HSS teeth, flexible high carbon steel backing for fast clean cut. For cast iron, stainless and structural steel, alloyed and non-alloyed aluminium, bronze, copper, PVC, acrylic and wood.